It's been a flurry of packages coming in at Lodge 2x3. The past week I think I have received about 15 mailings of cards, whether PWEs or envelopes with padding. For a while it was stacks on my desk - one, two or 12 piles of that are just waiting to get knocked over. Until you scan, there they sit. Well, inbetween periods of last night's Hawks win, I got the last of my scanning done. Trades I need to post along with 5 packs to display at APTBNL. The only thing left to do is go through the myriad of ChiSox cards and get them in their respective years. But we have five great evnvelopes I have received from bloggers that are due some love from me, so let's show three today and the other two on Friday (Throwback Thursday post tomorrow). And who knows what will show up in those two days. Robert runs the fun $30 a Week blog. I believe I saw a few cards on his want list, and I am always matching any serialed cards to his needs. Robert sent a small package (just 9 cards) but nine pieces of needs. Along with the 6 cards Robert knocked off my 2013 A&G base set needs, he included an insert card for Curious Cases, a SP for the 2013 Heritage and a super sweet OPC retro of Captain Serious. Thanks! Next up is Chris from Nacho Grande, a daily visit for me. I am going to jump on his trade stacks one of these days, but until then, I shoot Chris any Larkins I find, along with other Reds via PWE. Chris was kind enough to also beat on my '13 A&G list with about 25 cards. Here's a 3 card highlight. Another insert card. I just love the bat barrel shot of Harmon, and the windbreaker under Whitey's uniform. Don't see that look anymore. Thanks Chris! Last up today is Matt from Once a Cub. Matt and I pretty much have one of those vacuum tubes between our two houses. I rip packs and pull Cubs, and Matt seems to pull White Sox. At least we have someone to send them to. 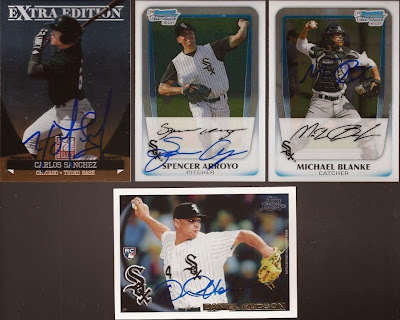 Matt did a bit of a ChiSox dump on me along with some special cards inserted. I really REALLY like this set from Upper Deck. 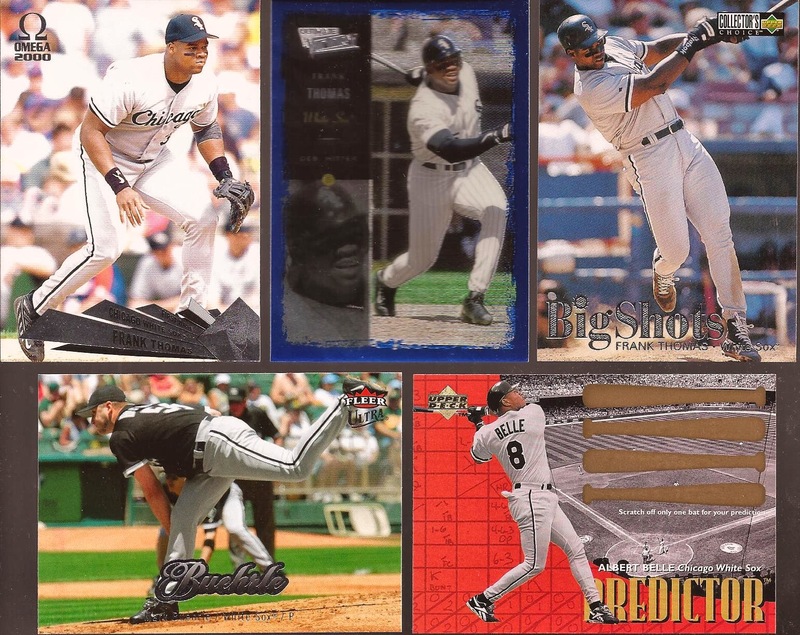 You see a far amount of images you don't see often on cards, though I think that Lopez was shown on this year's GQ. Doesn't matter because this is a nice trio of cards, and for the few I have of this set, all new additions. For a Pale Hose collector, it may be a shock I don't have a desire to start a Frank Thomas collection. That's not to say I don't want his cards. It's just that there are SO MANY that collect him, it's hard to get his cards at a reasonable price. But I will take these three, as I don't have any of them. The Buehrle is just a great card, only a little too close. Take it out 10 feet and that would be perfectly framed. Never seen the Belle predictor card. I should scratch it just to see what is revealed. 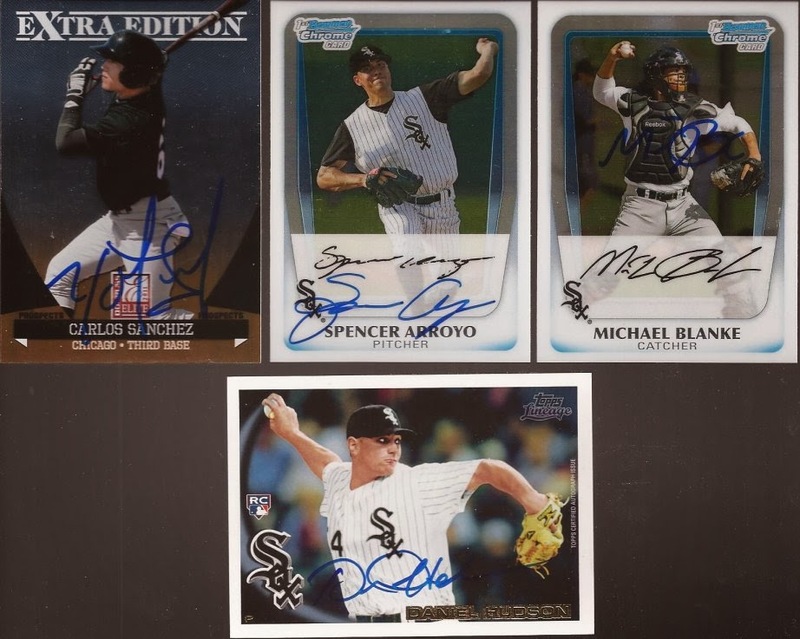 The one thing you can count on from Matt is his TTM cards, or for a bunch of his - in person. Matt has sent me some great autographs he has secured in person, and this package was no different. Best part of the Bowmans are the ability to match the autograph. I guess Topps isn't forging. Sanchez is working his way up quickly in the minors. Arroyo might get a chance to compete for a bullpen spot in 2014. Blanke is still developing. The Hudson on the bottom is a Lineage autograph. Let's see if he can come back from a 2nd Tommy John arm surgery next season. Thanks as always, Matt. That's all for now. I gotta go help my wife finish dinner. Love the retro Toews. The Hawks need to tighten up things in the third period but 6-1-2 after winning the Cup is very encouraging. Glad the package arrived safely Jeff, enjoy!